really rusted, but flat and straight, so I decided to do a full restoration, including ceramic chrome coating and an O2 Sensor bung. came off ever time that I touched it or set it down to work on it, so I took it for an initial sandblasting. 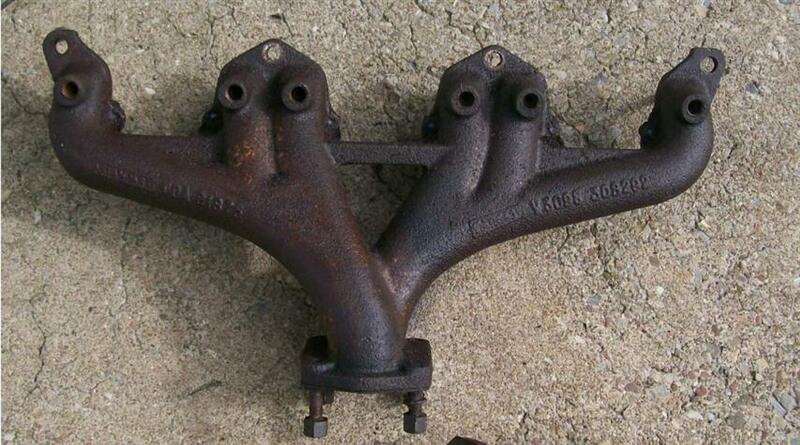 This is the manifold after a quick $30 blasting at a shop in CT. Not required, but I hate making a mess while I work. Time to start knocking out the emission tubes, as they won't be needed for my purposes. They usually drive right out. This is the flange and and the old gasket , which the sand blaster did a number on. The thread size for the injector rail plugs is 1/2" X 20. I'm using socket set screws to fill the holes. I wanted to re-tap all of the threaded areas to make sure there was no problem before the final blast and ceramic coating. I deal with the flange studs later, as two were frozen in and needed heat to get them out when it went for the milling work. These actually thread very easily, despite how they look. This wonderful milling machine is going to do some nice work to allow an oxygen sensor to go between the two side of the manifold. This is part of the equipment at the new shop of Her Majesty's Service, in Cranston, RI. Erik Nygaard is the owner and a great friend. This shows the milling of the manifold upper flange surface as well as the hole for the O2 sensor bung. The bung is now set in place and ready to be brazed in. All set into place and test fit to insure the threads are all OK. This is what the tip of the sensor looks like between the left and right side of the manifold for the stock twin exhaust pipes. but for ceramic chrome coating, there is a steel media used that actually cuts into the metal to give the ceramic a place to grip. Here is another view, after the bead blasting, showing the nice through hole from the milling machine. Just a side view for another perspective. Now that the frozen studs are gone, I can now re-tap the threads in the stud holes in the flange. These are 3/8" X 16 or 3/8 UNC. Time to test fit the socket set screws from Fastenal. These are black oxide and I may go to stainless or chrome, but they are fine for now. Remember, these are 1/2" -20 thread X 1/2" length in Black Oxide. Fastenal P/N (SKU) 1125702. I also ordered the 1/2"-20 thread X 5/8" length in 18-8 Stainless Steel. Fastenal P/N (SKU) 0171616. These will fill the threads completely to the top. These socket screws are also 1/2" long, which fills the threads pretty well. for factory Five Cobra kit cars. They have the in house capability of doing the blasting, as well as the ceramic chrome and powder coating. Another look down inside and they blasted the entire inside of the manifold for me, without my asking. Very professional, indeed. but I need to get some SS or Grade 8 lock washers to have a complete setup. Nice and clean and a good deal of coating down in there. This is the rear of the manifold as it sits on the car. Erik's welding looks very strong and good now that the ceramic chrome is on. The last view, all ready to go, with the socket screws in place and the studs and nuts on for storage. The new stainless socket set screws arrived today from Fastenal. Part # 0171616. You can see the difference between the 1/2" and 5/8" lengths. The 1/2" sit down in the threads and the 5/8" are a thread and a half above, which I prefer, along with them being stainless. Six of one, half dozen of the other, I suppose. They both will still block off the exhaust and that's what matters most. The last of the lasts view, all ready to go with the new stainless 5/8" length socket set screws.